The Rocktown Trails at Hillandale are nearly five miles of super fun singletrack located here, just outside of downtown Harrisonburg. All the trails at Hillandale are designed, built, and maintained by SVBC volunteers, and are great for walkers, runners, and mountain bikers of all levels. SVBC began work on the Rocktown Trails at Hillandale in January of 2007, and the trails opened to the public in 2009. Coalition members have spent over 3,500 hours building trail at Hillandale. And the work continues! 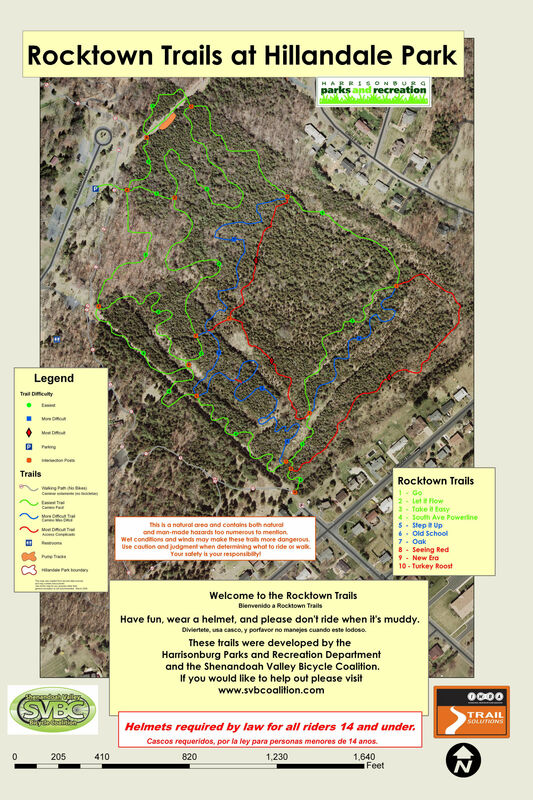 For more on the history of Rocktown Trails at Hillandale, see here. SVBC is constantly adding to the trails, so the existing map does not include all of the awesomeness that is Hillandale. Hillandale is fun in the winter, too.